in that thing - it's not easy. I had my second shift in a Central Park information kiosk on Friday. It's a three-hour shift and I have been completely exhausted by the end of each shift. I couldn't believe the woman who took the double shift in front of me. That's six hours, I don't know how she did it. 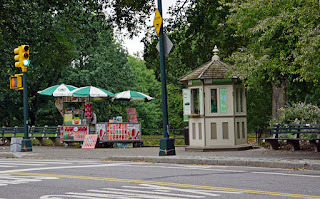 The kiosk shift on Friday was at the kiosk right near Strawberry Fields - if I had a dime for every time I was asked where it was (the answer - go to those food carts, cross the street, up the hill) I'd be rich. Where did people go in Central Park before Strawberry Fields was installed? My big exciting moment on Friday was giving directions in French. The woman was very nice and said I spoke French well. I screwed up cinq and quinze (5 and 15) though, which is dumb mistake. But still - the entire conversation was conducted in French and there was mutual understanding. Formidable!